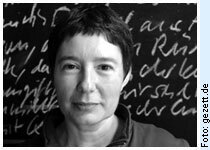 Brigitte Oleschinski, b. in Cologne, Germany, is a poet, performer and lecturer living in Berlin. Since the 1990s she has published poetry and essays to high critical praise. Her work covers poetry performances, early internet projects and crossover cooperations. She was invited to international poetry festivals around the world and has translated poetry from over a dozen languages. She also gives lectures and workshops on various topics dealing with poetry and intercultural dialogue in times of globalization. She is best known for her poetry volumes Mental Heat Control (Rowohlt 1990), Your Passport is Not Guilty (Rowohlt 1997) and Geisterströmung (DuMont 2004). Among other awards she has recieved the prestigious Peter-Huchel-Preis (1998), Ernst-Meister-Preis (2002) and the Austrian Erich-Fried-Preis (2004).